Faith loves both – people and numbers. As a hands-on person, she enjoys welcoming new people into the organization and see them building their careers creating social impact. The magic behind balancing numbers, creating budgets, presenting accurate books, ensuring that the company has complied with relevant authorities drives her. Faith loves organizing successful events, meetings and fostering a good work environment blending her Human Resource, Administration, Finance, Customer Service skills to ensure a good operations work flow in the company. Prior to joining Amani Institute, Faith worked as a Finance and HR lead with Gearbox Limited, a company that incubates hardware startups. She has also worked the same role in the NGO environment and started off her career in banking. Passionate about education, Faith holds a Certificate in Public Accounts and a Bachelor’s degree in Human Resource Management (Registered with IHRM). She is currently pursuing 2 masters Degrees at Kenyatta University and South Wales University in the UK, focusing on Strategic Management. 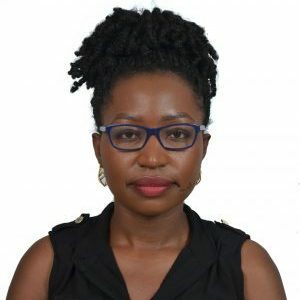 She is researching core competences and the performance of startup companies in Nairobi, Kenya. Her free time is spent with her two adorable daughters, the kitchen. Whenever she can, she travels to rural areas in Kenya to provide mentorship to young pupils and provide sanitary towels to girls in order to keep them in school and achieve their dreams.